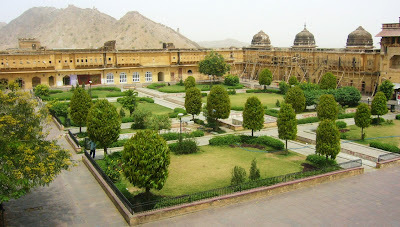 Amer Fort is situated in Amer, which is 11 kilometers from Jaipur. Amer, originally, was the capital of the state before Jaipur. It is an old fort, built in 1592 by Raja Man Singh. This fort is also very popularly known as the Amer Palace. The Amer Fort was built in red sandstone and marble and the Maotha Lake adds a certain charm to the entire Fort. Though the fort is quite old and may even look so from the outside, it is beautiful on the inside and boasts of various buildings of prominence like the 'Diwan-i-Aam', the 'Sheesh Mahal' and even the 'Sukh Mahal'. The Amer Fort has influences of both Hindu and Muslim architecture. This fort also has the 'Shila Devi' Temple and the 'Ganesh Pol' which is a gate that leads to the private palaces of the kings. The Amer Fort has many pavilions and halls of great interest and other popular attractions.